To monitor specific programs or activities on your PC, the best tool to use is the Resource Monitor. It’s far less complicated than the Performance Monitor, and it offers more information and control than the Performance tab in the Task Manager. Choose Resource Monitor Desktop app from the search results. The Resource Monitor window appears. 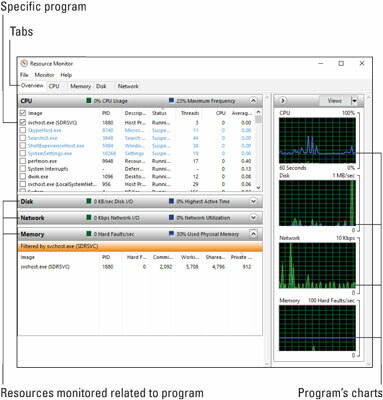 The Resource Monitor’s Overview tab, shown here, shows the big picture on system resources: CPU (processor), Memory, Disk, and Network, along with charts for each. The various tabs show more details and even more charts. What’s interesting about the Resource Monitor is that you can examine the effects of specific programs on resources. For example, shown here, the common service program svchost.exe is monitored. Its effect on resources is shown in each category (click the chevron to expand a category) as well as highlighted in each of the graphs. When you choose a program in this manner, you can spy on its effects on all resources.